The efforts of the current United States government to encourage or increase the level of oil drilling have been a major boost to the Indian guar gum production and processing. This is the reversal of a downtrend ongoing for two years. From November 2016, industry analysts have seen an 8 % increase in guar prices. The general market sentiment is that guar exports to the USA will rise by 25%. The increase in oil drilling sector in the northern America has also added to the positive expectation. The prices of the guar move in direct proportion to the crude oil prices. 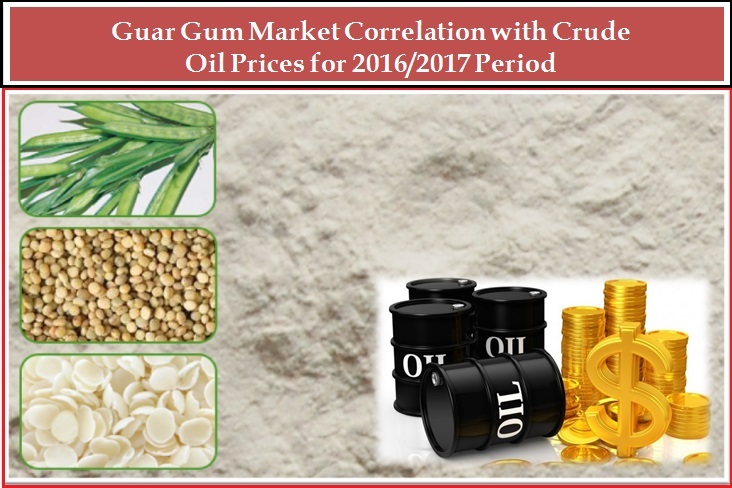 The drastic decline in crude oil prices created a direct decline in the prices of guar gum powder. The drop in global crude prices led to decreased shale exploration and a fall in demand of the guar gum powder. The prices of intermediate crude from west Texas fell from approximately $ 110 per barrel to $ 50 per barrel also created a major effect on importation of guar gum products. The accumulation of supplies in the oil companies’ stores also contributed to the decline in the price levels. The establishment of warehouses by Indian businesspersons in the United States, and the subsequent build up of stocks also contributed to decrease in demand. The number of oilrigs in the United States reached six hundred and fifty two in the third week of March 2017. This is the highest level from September 2015. There has been a direct and positive correlation between the active rig count and the crude prices. A closer analysis at these trends shows that when the crude prices hit the bottom, the number of operational rigs also dropped to minimum. Oilrigs require the guar gum powder for lubrication of the drilling process, and therefore its demand is in direct proportion to the performance of the rigs. The usage of guar in the oil mining has also helped crude companies produce more oil with fewer rigs due to the increased mining efficiency and performance of the oil wells. This has caused the demand for guar to prevail despite decreasing numbers of oil wells. From reliable industry analysts, there is already a good upward trend in the prices guar gum both in the local and in the export market. These have been attributed to demand from the primary oil production industries, and the decreased domestic supply of the product. The demand of guar by the global oil industry is estimated at 450 000 tons per year. If this production is not met in the current period, there is likely to be an imbalance in supply causing an increase in the prices. It is estimated that the in the year 2017, the North American oil and gas companies may increase their spending on exploration by up to 30 %. There has also been increased lending from banks to finance oil production. The usage of the cassia gum as a food additive is described in the EC regulation Number 231/2012, which defines the specifications of food additives. The gum is the purified seed endosperm from the Cassia Tora plant and has less than 0.05 of Cassia Occidentalis. The chemical formula consists of a high molecular weight polysaccharides made up of mannopyranose and galactopyrannoseunits. It is manufactured through a milling process, whereby the husks are removed from the seed and endosperm is washed to give a semi-finished product that is used as a feed additive. Further purification with isopropanol extraction results in a pure semi refined product that is used as the food additive. An analysis of the particle size distribution throughthe laser diffraction process showed that the cassia gum powder has at least 14.7% of the particles less than 50 micrometers in diameter and 2.8 % of particles less than 10 Micrometers in diameter. The determination of the stability of the gum is derived by establishing the ability to maintain the gel form, after being combined with the other gums. It has been noted that when the cassia gum is mixed with the other gums for optimum gelling, a stable gel is sustained even after long periods of storage. There are also no changes in the strength of the gel. In the manufacture of feed, it has been passed as an effective and safe gelling agent. The Gum is soluble in water and is distributed with water into the feedstuff. The efficacy of a product is the ability or the capacity to produce the desired effect, or the effectiveness in achieving the desired purpose. As a gelling agent, it has been found that supplementing water with blends of cassia gum and carrageenan gums results in high gel strength of up to 1100g/cm 2 .The gelling strength values, syneresis and the PH values of canned pet food with cassia gum and carrageen were measured after storage for 12 weeks . The food showed no losses in the gel strength over a period of time. When 0.1 % cassia tora powder is added to water and oil mixture, and 0.5% commercial emulsifier, a stable emulsion resulted that lasted up to 12 hours. This did not happen when the mixture containing the 0.5% emulsifier alone was used. The cassia gum is best used as a gelling agent when used together with other gelling agents such as the carrageenan and the Xanthan gum. It is also effective as a thickener when used with other gums like the carrageenan and the Xanthan gum. 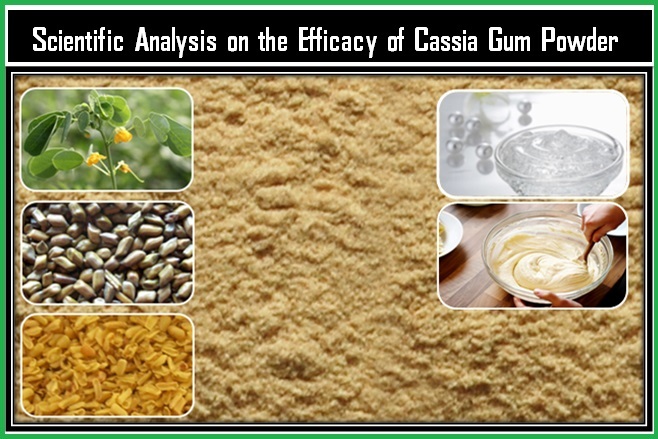 This research also showed that the cassia gum has good stabilizing effects of an emulsifier.